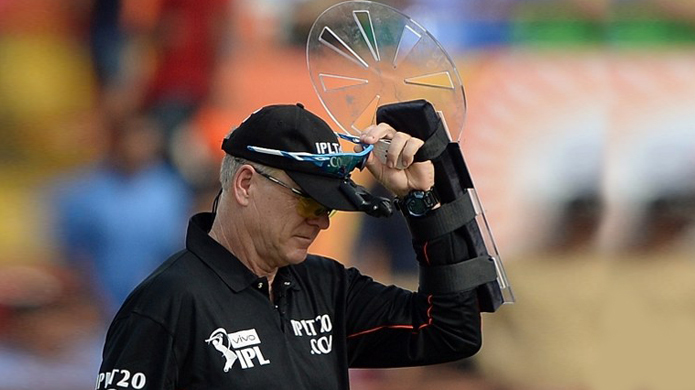 The umpires in this(2016) IPL are wearing a shield like gear on their hands. What is it called? I have read from a couple of articles that it is for deflecting the ball, thus protecting themselves. But, is it really so? If yes, then what is it called? If No, then what purpose does it serve, and what is it called? At the moment, this isn't standard equipment for umpires; only Bruce Oxenford is using it at the moment as far as I'm aware. As such, I'm guessing this is a personal piece of equipment that Oxenford is using and as such it doesn't have a formal name, but yes, it's obviously for the umpire to use as protection from the ball. For what it's worth, this isn't the first time Oxenford has used the "shield" - he also used it in the Australia vs West Indies World T20 warm up match earlier in 2016. Not the answer you're looking for? Browse other questions tagged cricket equipment officiating or ask your own question.